Chapman Dental is a small customer service oriented dental office located in Five Forks, on the East side of Greenville. We are open Monday thru Friday, from 10AM – 6:30 PM daily. Keep reading…you may really want to make us your family’s dental office. Chapman Dental P.A. (Professional Association) was established in 2012 by Dr. Alex Chapman. It was his dream to own his own dental office where he could provide patients with THE BEST dental care available, focusing on his patient’s needs. We provide appointments after 5pm, are open on Fridays, and truly care 100% about our patients. Unlike most practices, Chapman Dental does not focus on moving as many patients in and out the door as possible for profitability. We take our time and do things the right way. We don’t cut corners. If you have questions about dentistry (or driving cars on race tracks, one of Dr. Chapman’s hobbies), he will have time to sit and answer them for you. If you are a patient at Chapman Dental, Dr. Chapman will gladly come to the office over the weekend or at night if you need him. Try and find another dentist in Greenville who will not hesitate to speak with you on the phone or in person any time you need him. Dr. Alex Chapman is a native of Spartanburg SC. He attended Spartanburg Methodist College, then moved to Charleston SC to attend the College of Charleston. He then attended the Medical University of South Carolina for dental school. He is a road course driving instructor, in short, he teaches people how to drive on race tracks. He is a BMW and Corvette owner and maintains his track / street cars himself. Sometimes in between patients, he may be found playing on his drumset…which may or may not be at the office. 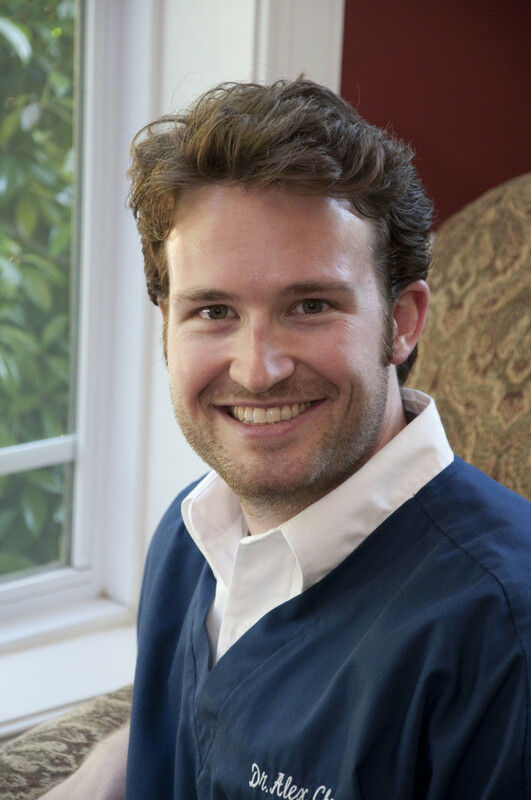 Dr. Chapman believes strongly in doing the best dentistry that can be done for his patients. He uses the latest in technology, and will offer every option to fix your teeth, not only the ones that are convenient for him. He does not rush through procedures, is very gentle and patient. Angela is Dr. Chapman’s assistant and right hand girl. Born and raised in Greenville, she eats IHOP for breakfast, lunch, or dinner! Don’t ask her what she thinks about the Awful Waffle. Angie tells it like it is and we all know she ain’t never lied. Michael Jackson is her favorite recording artist, and “Off the Wall” is her favorite album. She also loves Maxwell. She likes his music too. Brooke runs the front desk. She also helps out with pretty much everything at the office including assisting. Brooke is a double Clemson grad, having received her bachelors and masters degree from “where the blue ridge yawns its greatness”. She tries to find time on the weekend to visit her sisters there and to cheer for her tigers. While at Clemson, Brooke was very active in Alpha Phi International Sorority and continues to volunteer with them. When she’s not at Chapman Dental, she loves spending time with her husband and herd of pets including a dog, a bearded dragon named Puff from her time as a highschool biology teacher, and a cat named Layla (probably 4-5 other cats) whose name was inspired by a song by her favorite musician, Eric Clapton. Althea is Dr. Chapman’s Hygienist. She has 30+ years experience as a hygienist. She is the office mom to our therapy dog Caroline and is her chief dresser / stylist. Althea loves sweet tea from the Spice Diner, where we frequently eat. With her upbeat and bubbly personality, she always keeps her patients and the rest of the staff laughing. Jay is Dr. Chapman’s other Hygienist. He is a hygiene instructor / professor at Greenville Tech. He loves music from the 50’s – 80’s and collects vinyl records. He loves science and loves his job. Jay is very precise, organized, and thorough. Even though Jay started working for Dr Chapman in 2018, they have known each other since Chapman Dental opened in 2013. Mel is Dr Chapman’s assistant. She is from Holly Hill in Orangeburg County. Mel is always upbeat and loves her job. She always has a smile and a positive attitude. She is a hard worker and always strives to improve in everything she does. When Mel isn’t at Chapman Dental, she is very family oriented and loves hanging out with her Huge family. She also volunteers at her church feeding the homeless. Caroline is the office therapy dog. She is 8 years old and was adopted from the humane soceity. She has been trained to sit in people’s laps during procedures. Nervous patients and children love her. In her spare time she enjoys going for walks, playing tug of war, playing fetch and not returning the thrown item, barking at distant noises or when she is startled, and cheese. She is shy at first, but gets to know and love our patients…Squirrels not so much. At Chapman Dental, we cater to patients without dental insurance. If you do not have dental insurance, please come see us, as you will find nowhere in Greenville that will work harder for you and your needs. For patients who already have dental insurance, Chapman Dental does as a courtesy file your insurance claims for you. Remember, the dentist is your advocate, and no dental office will stand up for you to your insurance company as fiercely as Chapman Dental will. Do not let your insurance company make choices for your dental care. Make those choices yourself, and let our office help empower you to do it. If you are going to an in network office and you lose your job, or for some reason your insurance lapses, you are out of luck. At our office, your dental care is not hinged around your insurance, so we are able to take care of you regardless. Bottom line, please give us a chance to be your dental office. Few people who become our patients ever seek another office. It never hurts to come meet us and see what you think! I found Dr. Chapman because I needed a doctor who worked evenings and weekends. Seems like all dentists are closed on Friday. I had a lot of anxiety because of previous dental nightmares, well Dr. Chapman turned my frown upside down !! He was gentle, caring, thorough, and honest. (Also has a beaufiul singing voice 🙂 ) So many dentists today seem like they just are running a money / insurance racket. Dr. Chapman is NOT that guy. I would recc. him to all my friends and family, and he has a patient for life with me !! Thank you for changing my mind and views of dentists and dentistry in general! Going to the dentist has never been something I have looked forward to. This is not because I am afraid of physically being at a dental office but rather a fear of the quality of work. My main concern is the work not being done right and having to go back for a repeat procedure costing more money and causing more discomfort. Because I wanted my dental work done right the first time I decided to take the three hour drive from where I live in Atlanta to see Dr. Chapman at Chapman Dental. My experience at Chapman Dental was none other than spectacular! Both Dr. Chapman and his very nice hygienist Ann were a pleasure to be around. They were both extremely courteous and professional. Ann took extra time to give me tips on how I can take better care of my teeth while Dr. Chapman thoroughly explained what procedures he had to perform and why. You can really tell he car es about his patients and certainly knows his stuff- and not just about teeth… cars too! I would HIGHLY recommend Dr. Chapman to all of my family and friends! In his care for me, he has demonstrated a knowledge of dentistry and the ability to apply that knowledge that seem far beyond his years of practicing dentistry. He has earned my confidence. Ann Stewart is a superb hygienist/assistant. (I actually followed her to Dr. Chapman’s practice!) Together, she and Dr. Chapman provide a rare combination of warm, personal care and the highest degree of professionalism and expertise. Chapman Dental © 2019. All Rights Reserved.